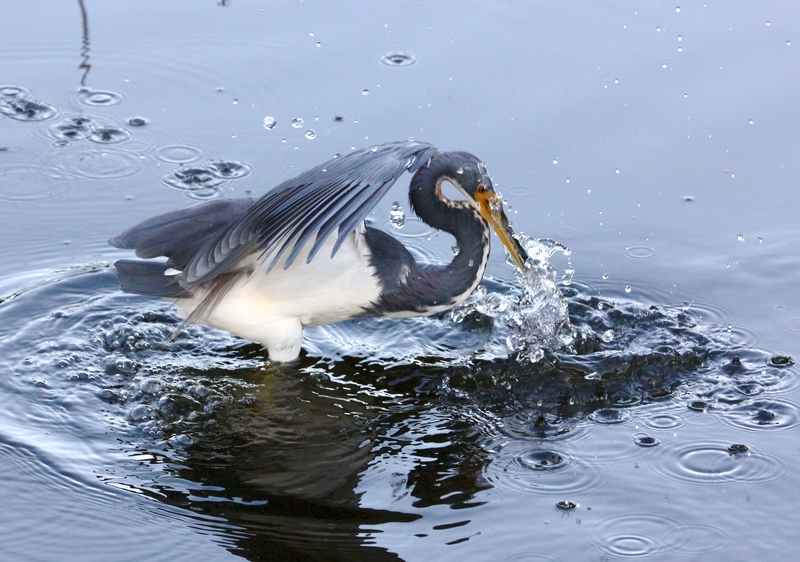 I love to watch Tri-colored Herons as they hunt in the shallow water – their technique is so showy! It’s no wonder they are so slender – they perform feats of acrobatics over and over again just to fill up on a meal of one teeny, tiny, little fish after another.
. . . he jumps up and twists around backward. 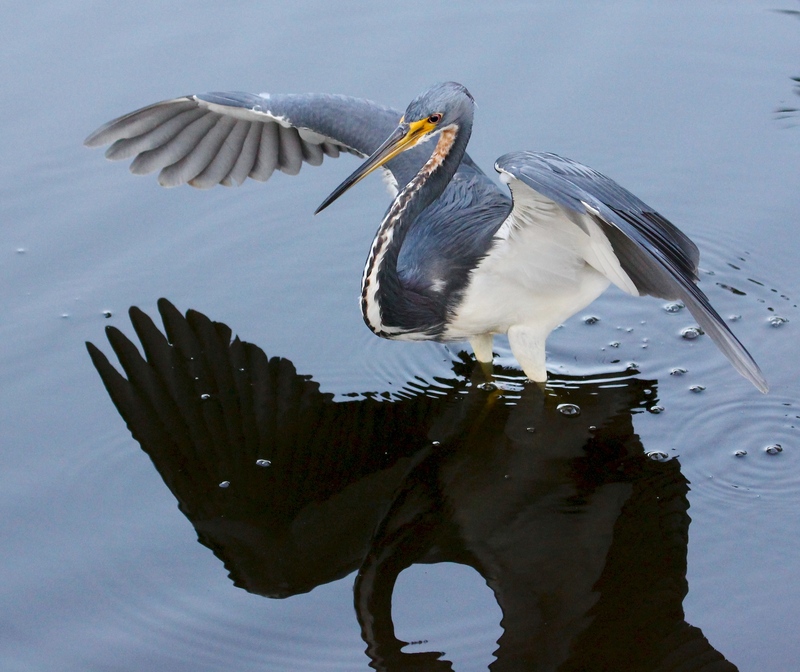 At the same time, he spreads his broad wings wide, as a “cloak”, to create a large, dark shadow over the water. All the better to see those little fish . . . ! Then he jabs his VERY long beak into the water, with a highly dramatic flair, but almost always comes up with only a very small fish. He pops the fish down his throat in a flash, and then starts the process all over again, beak still dripping from the last morsel. The Tri-colored Herons repeat this quite predictable series of movements many, many times in one feeding session. If the ‘fishing’ is good, they sometimes stay in one spot for 15-20 minutes or more, flitting about in the water. 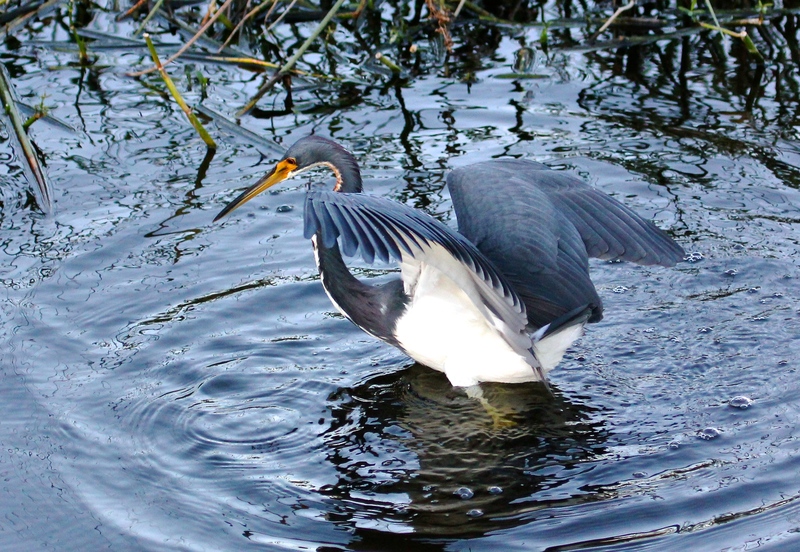 This terrific short video, posted about a year ago on YouTube by Dan Emlin, is a great example of this behavior in action: Dance of the Tricolored Heron. 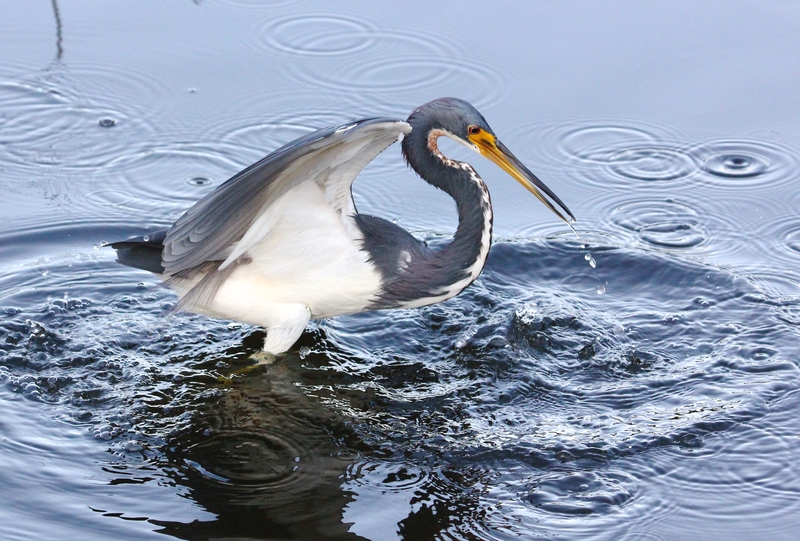 This entry was posted in Birds and tagged Tri-colored Heron. Bookmark the permalink. « Let the courtships begin…! I never saw them do their dance and you are right, they are showy. I have seen them here, but only a few times. They must be very shy. I like your photos, I always like to see the behavior of the birds. I agree, and thanks! I find that field guides often don’t give enough information about behaviors, but David Sibley’s Bird Behavior book, and many of the other new online websites are rich resources.